In a small bowl combine, dijon mustard, apple cider vinegar, olive oil, honey, dry basil, salt, and pepper. Mix until thoroughly combined! Set aside. 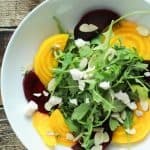 In a large bowl add fresh arugula, golden beets, red beets, sliced almonds, goat cheese, and fresh thyme. Drizzle with dijon vinaigrette, toss, and serve.